A cast copper alloy pot leg from a copper alloy vessel. 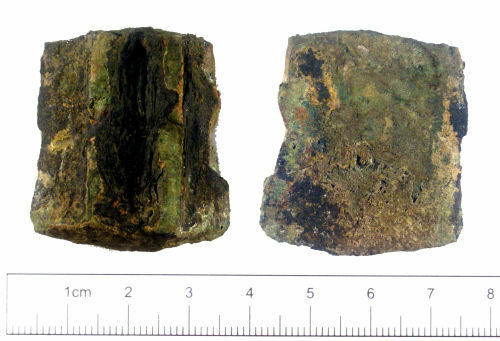 The fragment consists of the foot and part of the leg. The leg has two large ridges running parallel to each other on the front surface. The reverse of the leg is flat. The surface is extremely pitted and worn, as is the break. It has a mid brownish-green patina. Due to a lack of context it is not possible to closely date this object, although it is medieval to post medieval in date.